though he were dead yet shall he live." Easter is approaching and with that we often think of the resurrection of Jesus. 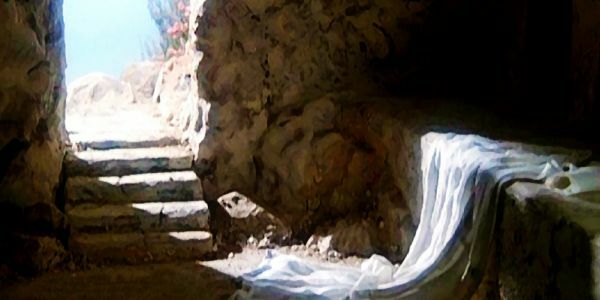 We see lots of pictures and quotes about the empty tomb and our risen saviour, and it truly is amazing. Our God is NOT dead, he IS alive!!! But is that all Jesus is to us? A nice picture or quote? There is so much purpose in the resurrection of Jesus, without it we would still be dead in our sin. It is by his resurrection that we have a lively hope. That we can have life. ..."I am come that they might have life , and that they might have it more abundantly." John 10:10. By "plenty of Jesus" I mean, first of all, is He your saviour? And if you are his child are you clinging to him? Are you trusting him? Are his words precious to you? Do you let him shepherd you or are you stubborn and think that you can find your way? The abundant life comes from him and what he has done. It's not about us and what we can do. Are you overflowing with the life and love of Jesus? Does that mean that your life will look perfect? NO! It doesn't mean that you have it altogether all of the time or that you don't ever struggle. I do think that some of what it means is that you have so much gratitude for what Jesus did for you that it just overflows and that you accept his grace in your life everyday to become more like Him. The power of our risen saviour enables us to walk righteously, to walk in victory, to walk in love. I just want to take a moment here to relate this all to us as sisters in Christ. Are we allowing Christ to empower us in the words that we speak or in our actions? Or do we let the world influence us in our behaviour? Is there life or death in our conversations? and they that love it shall eat the fruit thereof." Are we speaking death by gossiping, criticizing, judging or putting others down? Or are we speaking life by encouraging, praying and lifting up? We live in a time where there is just so much comparing(especially where social media is involved) and it's easy to feel like we are not good enough. And this happens just as much in christian circles as it does with unbelievers, maybe even more. Ladies, let's make it a point not to do this to each other. Life can be difficult enough as it is without having someone step on you when your already down. Instead be the person that comes along and helps someone up and speak LIFE into them. Let them see the life of Jesus in you. Jesus IS the life. He has made it possible for us to to have life and also to be life-givers. Remember the life and power of our risen saviour every single day! !